Vanderpump Rules’ Kristen Doute Dating Brian Carter After James Kennedy Split: Pictures! Moving on! Following her split from boyfriend James Kennedy, Kristen Doute is coupling up with a new man. Us Weekly can exclusively reveal that the Vanderpump Rules star is dating a guy named Brian Carter — and from the looks of these photos, they&apos;re having a great time together. Doute and her new beau — who goes by just Carter — met through the dating app Bumble after she and Kennedy parted ways a few months ago. Earlier this week, they took their romance into the wild, hitting up San Diego Zoo Safari Park with friends. 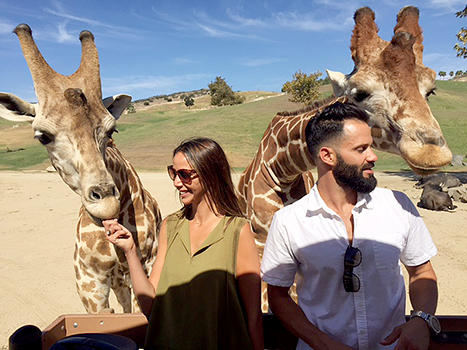 Joined by Doute&apos;s Vanderpump Rules costar Scheana Marie and her husband, Mike Shay — among others — the new lovebirds got up close and personal with a couple of giraffes. Doute tweeted about the adventure on Wednesday, Sept. 2, sharing a photo of herself with a couple of girlfriends. "The best day of my life," she captioned the pic, adding the hashtags #GIRAFFES and #pumprules. She later added: "Fleetwood Mac in our limo after a day feeding giraffes. Please say this is how it will also end." Doute and Kennedy broke up while filming Season 4 of their hit Bravo series. Her rep had no comment on her new romance with Carter.